The Minnesota Supreme Court is still deliberating on Norm Coleman's latest appeal in the drawn out Senate Election of 2008; but at this point their ruling merely appears to be a legal formality. Even Minnesota's Republican Governor, Tim Pawlenty, has indicated his intent to adhere to the MNSC's ruling by signing the Election Certificate should Al Franken be declared the victor. With a ruling likely to come this week or next, Al Franken seems poised to become the legal victor, and there isn't anything anybody can do about it. Michael Brodkorb of MinnesotaDemocratsExposed.com does however seem intent on altering the public's perception. On June 8th, just five days before his election as the new Deputy Chair of the Minnesota Republican Party, he filed public data practice requests with seven of Minnesota's counties seeking photocopies of rejected absentee ballots. This correspondence is a request for access to public information and data relating to the 2008 general election for United States Senator in your county under the Minnesota Government Data Practices Act ("MGDPA"), Minnesota Statutes, Chapter 13. Minnesota Statutes § 15.17 requires all government entities to make and maintain all records relative to their official activities. Minnesota Statutes § 13.03, subdivision 1 requires all government entities to keep records that contain government data in a way (or ways) that makes the data easily accessible for convenient use. The undersigned requests copies of that portion of the front side of all ballots relative to the 2008 United States Senate general election contained within rejected absentee ballot envelopes in your possession that were not submitted late and were not submitted by persons who otherwise voted in the 2008 general election (either in person or by replacement absentee ballot). This request does not seek to have the undersigned open or unseal any absentee ballot envelopes; to the extent any such envelopes have not yet been opened, the undersigned requests that an election judge do so. This request also does not seek access to any data regarding any individuals, including voter registration applications, voter registration lists or any other information related thereto and subject to restricted access under Minnesota Statutes § 201.091. Finally, this request does not seek copies of the absentee ballot envelopes themselves or any accompanying materials, such as absentee ballot applications. In short, this request in no way seeks to ascertain which person(s) voted for which candidate(s). The request can be easily complied with while protecting the secrecy of the ballots. This information/data is clearly public information under the MGDPA. As you know, Minn. Stat. § 13.03, subdivision 1 provides that all government data collected, created, received or maintained is public information unless classified by statute, federal law or temporary classification as confidential, private, nonpublic or protected nonpublic data. No such classification exists for the information requested. No Minnesota statute provides that the ballots contained within uncounted rejected absentee ballot envelopes is nonpublic or private information if opened by an election judge; although Minnesota law requires you to securely maintain all election materials, no Minnesota statute exists which denies the public the right to inspect and/or receive copies of the ballots contained within rejected absentee ballot envelopes. As the agency with jurisdiction over all ballots and election materials within your county, it is your duty to comply with data practices requests under the MGDPA and the undersigned is not aware of any statutory or other authority which prohibits you from opening the rejected absentee ballot envelopes while maintaining the secrecy of each person's intended vote for the purposes of complying with this request. There is simply no risk whatsoever that the secrecy of any ballot(s) will be compromised. Again, this request seeks only a photocopy of the section of ballots relative to the 2008 general election for United States Senator contained within certain rejected absentee ballot envelopes in your possession or under your control and in no way seeks to ascertain which person(s) voted for which candidate(s). There are several catastrophic assumptions and falsehoods located within Brodkorb's meager request. I've bolded the fallacious and contradictory portions from his request above and will now address each item below. The following government data is classified as nonpublic data with regard to data not on individuals, pursuant to section 13.02, subdivision 9, and as private data with regard to data on individuals, pursuant to section 13.02, subdivision 12: Security information; trade secret information; sealed absentee ballots prior to opening by an election judge; sealed bids, including the number of bids received, prior to the opening of the bids; parking space leasing data; and labor relations information, provided that specific labor relations information which relates to a specific labor organization is classified as protected nonpublic data pursuant to section 13.02, subdivision 13. 13.02 COLLECTION, SECURITY, AND DISSEMINATION OF RECORDS; DEFINITIONS. "Nonpublic data" means data not on individuals that is made by statute or federal law applicable to the data: (a) not accessible to the public; and (b) accessible to the subject, if any, of the data. Subd. 12. Private data on individuals. "Private data on individuals" means data which is made by statute or federal law applicable to the data: (a) not public; and (b) accessible to the individual subject of that data. Minnesota § 13.37 essentially states that unopened absentee ballots are private data and are therefore inaccessible to the general public. The subject of this request, rejected absentee ballots, are currently unopened and therefore qualify for protection under § 13.37. 203B.12 ELECTION JUDGES TO RECEIVE AND COUNT BALLOTS. Subd. 4. Placement in container; opening and counting of ballots. The ballot envelopes from return envelopes marked "Accepted" shall be placed by the election judges in a separate absentee ballot container. The container and each ballot envelope may be opened only after the last regular mail delivery by the United States postal service on election day. The ballots shall then be initialed by the election judges in the same manner as ballots delivered by them to voters in person and shall be deposited in the appropriate ballot box. The rejected absentee ballots requested by Brodkorb are not marked with "Accepted" by definition because they were "Rejected" under § 203B.12 subd 2. As a result of their current "Rejected" status, the absentee ballots in question would never qualify for the "separate absentee ballot container" and could therefore never be opened by an election judge. At this point, the first half of Brodkorb's argument is clear; he wants election officials to open his requested rejected ballots. Brodkorb then justifies this request by stating, in the second bolded portion, that the ballots then become public data if they are opened by election officials. It doesn't make a whole lot of sense; he is attempting to justify one action with another. The rejected ballots are private data, so to make them public, an election judge needs to open them; but an election judge cannot open them because they are rejected. Brodkorb's entire argument is circular and without merit. I have received responses to all of my requests for public data and every county and city has denied my request. I'm reviewing my options and I'll have updates on this subject in the next 24 hours on Minnesota Democrats Exposed. Brodkorb's request appears to have been flatly denied by each jurisdiction. He does however have at least one other option. Brodkorb could bring forth an action to compel discovery of these rejected ballots in accordance with MN § 13.03 subd. 6. I don't know how this would work, or if rejected absentee ballots even qualify for discoverability. It will be interesting to see if Brodkorb continues to pursue these data practice requests when he becomes the new Deputy Chair of the Minnesota Republican Party this Wednesday. "Of 39,165,191 votes counted (85 percent), Mahmoud Ahmadinejad won the election with 24,527,516 (62.63 percent)." He announced that Mir-Hossein Mousavi came in second with 13,216,411 votes (33.75 percent). Mehdi Karroubi with 333,635 votes (0.85 percent). He put the void ballots at 409,389 (1.04 percent). Despite the veil of electoral authenticity, rather large anomalies have been identified. Juan Cole quickly provided circumstantial evidence while the academic folks took a little more time completing their peer-reviewed papers. A consensus has emerged, even the Iranian State TV has acknowledged discrepancies in the election. 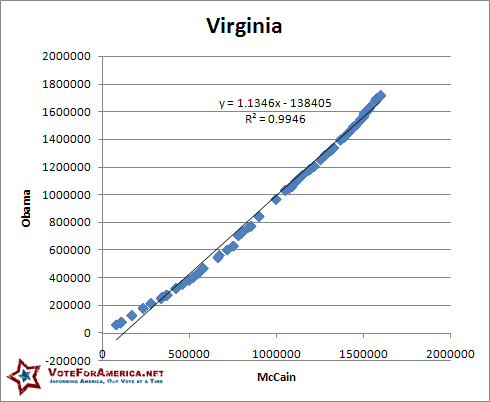 Andrew Sullivan posted multiple versions of this graph to his blog on June 13th. From the various versions it became clear that the data source was consistent, but the application varied. 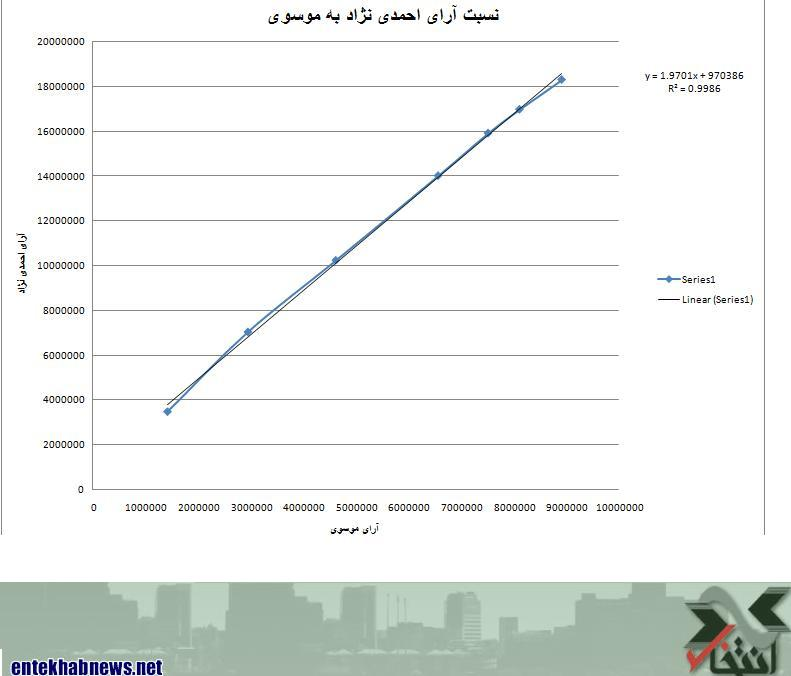 Iran's Entekhab News and web based TehranBureau.com both used the election results provided by JameJamOnline.ir to create their graphs; which were later referenced by Sullivan. The percent of the vote reported at each given coordinate is calculated with respect to the final two-way vote total; the reporting percent is overlaid near its associated coordinate. It is also important to note that there are two data sets. One is blue and has six dots while the other is red and has seven dots; the other red dots are exactly hidden behind the six blue points. 1. Ahmadinejad's vote total is represented by the X-axis and Mousavi's vote total by the Y-axis. 2. Entekhab News plotted [PNG] seven data points while TehranBureau's graph [PNG] excluded the first data point, while using the other six. 3. The regression technique is a linear least-squares approximation that is not forced through the origin. 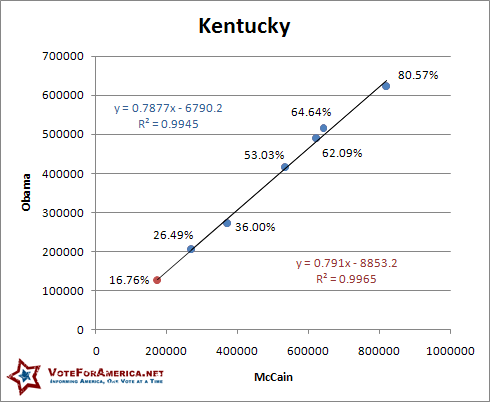 Ideally, the linear equations should pass through the origin; because at some point in time, before any votes have been counted, both candidates have zero votes. By applying the data within fact #4, it becomes clear that the graph only encompasses about 45% or 60% of the total vote for the six and seven point graphs respectively. The entire analysis takes place within this region; the respective linear correlations are only valid within these ranges. 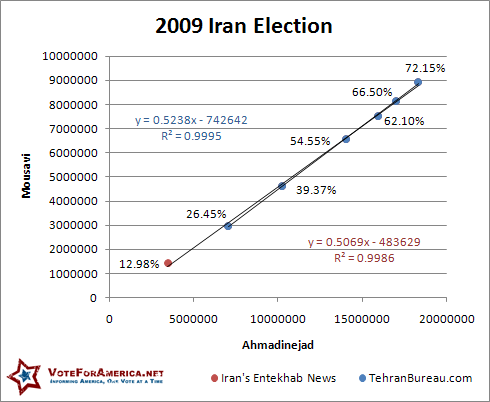 The vertical axis (y) shows Mr. Mousavi's votes, and the horizontal (x) the President's [Ahmadinejad]. R^2 shows the correlation coefficient: the closer it is to 1.0, the more perfect is the fit, and it is 0.9995, as close to 1.0 as possible for any type of data. Statistically and mathematically, it is impossible to maintain such perfect linear relations between the votes of any two candidates in any election - and at all stages of vote counting. This is particularly true about Iran, a large country with a variety of ethnic groups who usually vote for a candidate who is ethnically one of their own. Muhammad Sahimi's assertion is not well received and lacks any proper causation; especially given the 45% window of relevance. 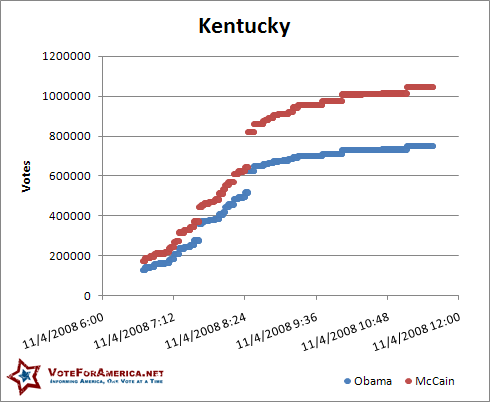 In fact his "impossible" claim appears to be baseless when compared to relevant data from the 2008 Presidential Election in the USA. 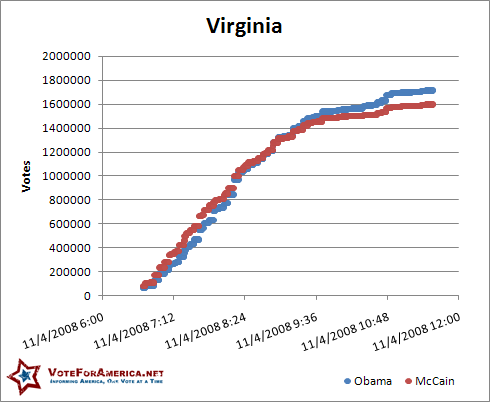 I intend to reproduce the high R^2 value using real-time data I collected on November 4th, 2008. The reported vote totals from each state were queued for download about 400 times an hour from MSNBC.com; data was collected in a circular queue as fast as possible. This does not mean that I have a complete set of data; networking and storage issues created significant discontinuities within the data, especially as the night progressed. MSNBC was used as the source because it was the only website that presented the election results as pure HTML; CNN, CBS, et al. used an asynchronous reporting scheme that prohibited the automated retrieval of their reported election results. Using some of this data, primarily from the East Coast, I will prove that a linear trend with a very high R^2 is the expected outcome of such a graph. 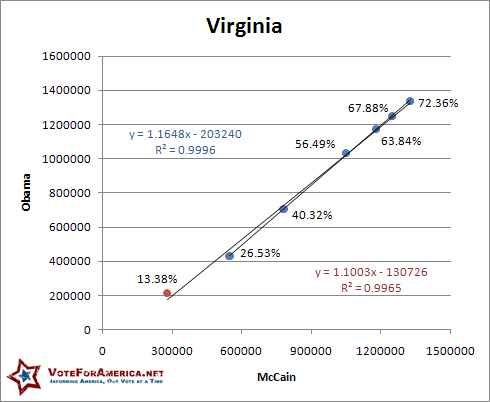 The Virginia graph seems to support the linear trend we saw in the Kentucky graph, but again the R^2 value is slightly lower than our target. 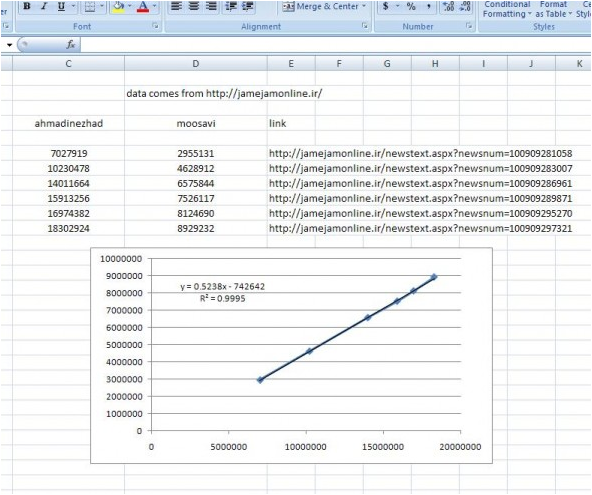 This discrepancy can likely be attributed to the large number of points plotted, around 1,500, in the preceding graphs. If we were to strictly adhere to our four previously stated facts, specifically by using just six or seven points, we could probably achieve higher R^2 values. Let's go ahead and do that now. Some rough extrapolations must be done to satisfy these thresholds; there are several ways to do this, but the two-way vote total was chosen as the measuring stick. When the distribution of the data resulted in two points equally spaced from the intended threshold, the larger percentage was used. This is not a perfect scenario, but it should still serve to facilitate an unbiased result. If you don't like my methodology you can download the data in CSV format at the end of this article and make your own rules. The R^2 value associated with the six point regression, .9996, is higher than the R^2 value of .9995 associated with the TehranBureau graph. The seven point R^2 value is however lower than the Entekhab News value of .9986. This unarguably debunks Muhammad Sahimi's assertion of statistical and mathematical impossibility. Such an outcome is very possible, perhaps even probable. Pennsylvania's R^2 values match the TehranBureau mark and fall just short of the .9986 value needed to equal the seven point correlation coefficient presented by Entekhab News. 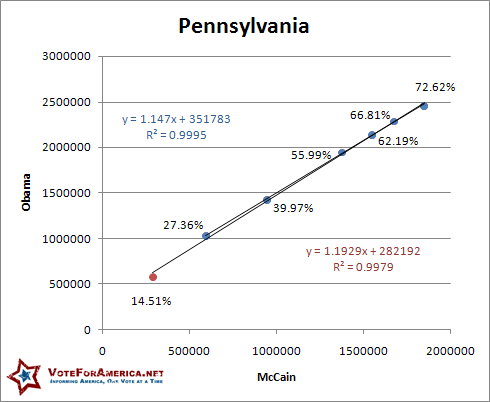 Pennsylvania is however more urban than Iran by about 10.0%; but given that this is now the third state with an R^2 in excess of, or equal to, the value claimed by an Iranian source, the presence of a linear correlation is irrelevant to the possibility of election fraud. Having dispelled the individual R^2 values for both the six and seven point data sets, I never ran into a state that met or exceeded both R^2 values. This lack of repeatability may be significant, but based upon the preceding work, its likely just a case of random coincidence and inconsistent data. 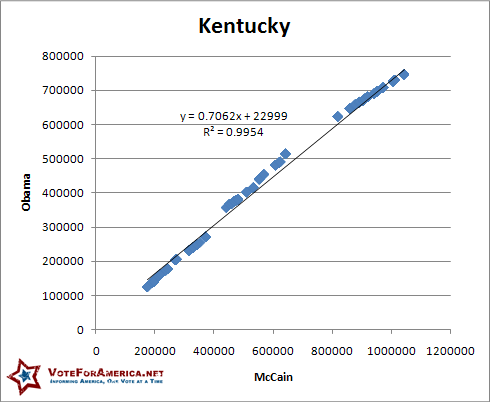 The bottom line is this, a linear relationship between two candidates' vote totals is the expected correlation. 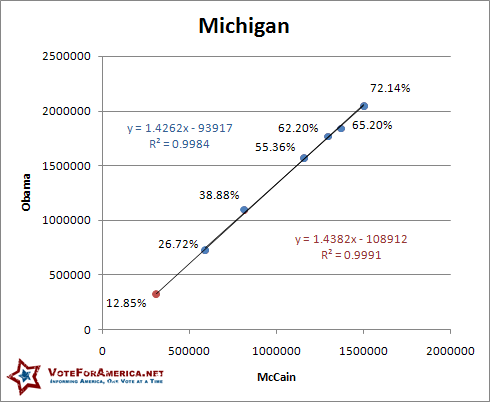 The direct result of this research does not however prove or disprove election fraud, it simply invalidates the linear correlation metric as a means of identifying fraud. If you do anything useful or interesting with this data, please let me know. The Minnesota Supreme Court convened today at 9 AM CT for the oral arguments associated with Norm Coleman's election appeal. The proceedings lasted approximately 69 minutes; upon their conclusion, each candidate's representation addressed the media on the second floor of the Minnesota Judicial Building. Justice Page: We have one case for argument this morning, in the matter of the contest of general election held on November 4, 2008 for the purpose of electing a United States Senator from the State of Minnesota. Mr. Friedberg I see you have reserved 10 minutes for rebuttal. Joseph Friedberg [Coleman]: With the court's permission your honor. Justice Page: You may proceed when you are ready. Mr. Friedberg: Morning and may it please this court; my name is Joe Friedberg, I represent [Norm Coleman]. Let me begin by saying that Minnesota is quite different from many states. We have problems within our institutions and when we do, we deal with them candidly and openly, we don't minimize them or sweep 'em under the rug to be discovered later by a federal court during 1983 litigation. That's why finding of fact 47 of the trial court is so surprising. Announcing that we are proud of rejecting only 0.5% of our total ballots cast in November is misleading at best. The only ballots that get rejected are absentee ballots; and our officials rejected 4% of them; 12,000 citizens who made good faith efforts to vote were disenfranchised for a variety--. Justice Page: Did these 12,000 citizens comply with the absentee ballot voter requirements. Mr. Friedberg: Many of them did substantially your honor, many of them did. Justice Page: Substantially? What does that mean? Justice Meyer: Where is evidence from the overwhelming majority of the counties and cities? Mr. Friedberg: Every auditor we called, as I recall, made exceptions [to the admittance of absentee ballots]. Now I think we only called 26 or 27--. Justice Meyer: And we have 87 counties, we are reviewing the work of a panel of three trial court judges here and they took evidence. Where is the evidence? Even as you called, as you said, you didn't even call witnesses from a majority of Minnesota's counties. You are asking us to presume, based on the testimony from a sampling of counties that that practice is applied to a majority of the counties. Friedberg responded by hesitantly referencing the assumed equality of populations within Bush vs. Gore to compare the "relaxed standard in Brower County with the unrelaxed standard in Palm Beach." Friedberg would then go on to state that "we have made our case" when "Plymouth kicks out 75 for signature mismatches and 31 counties in the state kick out none." I think Friedberg has a valid point from a mathematical standpoint if true; the Plymouth scenario presents a significant outlier and the aforementioned sampling of "26 or 27" counties represent a statistically sound sampling of all 87 counties. An inconsistent application of absentee ballot compliance in "26 or 27" counties would indicate to me, although devoid of legal rigor, that a problem existed, regardless of the remaining 50 or so counties. Whether the Coleman campaign adequately provided evidence to support this claim is vague at best. Justice Page: Council, before you get to that finding of fact, let me ask you a question. Hopefully council for the other side will be able to respond to this on the rebuttal. To the extent that the United States Senate will make the ultimate decision here, and the extent that they don't have to follow what we do. How do we issue an opinion, without it being an advisory opinion? In essence, do we have authority to do anything here? Marc Elias [Franken]: Your Honor, this question was raised with the district court as to whether the court had jurisdiction. The court found, and we believe appropriately so, that the court had jurisdiction to determine who received the most lawful votes, even though the Senate has within its jurisdiction to decide who is seated. Elias would then go onto quote a South Dakota case involving Tom Daschle from his days as a Congressman. The referenced case was eventually linked to a Supreme Court decision stating that so long as the state process does not impede the US Senate, the state court is not "deprived of jurisdiction." The MNSC clearly has the power to declare a winner under Minnesota Statute, but the US Senate is under no obligation to act in accordance with any decision. The issuance of an election certificate for the sole purpose of full representation is irrelevant to the Supreme Court's present responsibility; an election certificate will apparently only be issued upon the thorough completion of the appeals process. The sole duty of the MN Supreme Court is to determine the candidate who received the largest number of legally cast votes, not to ensure federal representation or for any other purpose. Mr. Elias: From the March 31st order of the trial court, in which [the Coleman campaign] held that of all the rejected absentee ballots, the parties proved registration for approximately 650; 650 of all of the ballots presented to the court. That's voter registration, that's not all of the other requirements that appellants now have complaints about. But this is the most fundamental requirement, that the voter be registered. Of those 650, 351 were opened and counted. So the universe of ballots, properly plead and about which this trial took place, stands at 299. Now, obviously the margin separating the two candidates is 312. As a result, even if everyone of the three-hundred or so ballots, for which voter registration was proven, doesn't mean the witness was registered, doesn't mean that the certificate was completed, it doesn't mean that they only cast one ballot, but that they were at least registered. Even if all three-hundred of those were for the appellant, and even if all three-hundred met all other requirements, it would still be impossible for the appellants to make up the difference. The remainder of Elias' time was spent discussing the finer points of due process and equal protection. Elias contended that the discrepancies between each county served to "grease the joints" of election reporting. He later defended any breach of due process or equal protection on the grounds that the inconsistencies were not intentional or systematic and could therefore not be classified as in bad faith or fraudulent as required within Bush vs. Gore. Elias concluded his presentation by stating that election officials used "the different tools, available to them in the different jurisdictions" to "administer a fair election" within the confines of the law. Mr. Friedberg then returned to the podium for the final fifteen minute stint and made three main assertions before the court adjourned. He first presented the varying processes by which each county voided an invalid ballot, thus potentially creating cases where the voter was registered, but their vote was not counted due to a failure to comply with another statutory requirement. Friedberg then reasoned that these registered voters should have their vote counted based upon the application of substantial compliance. Justice Page then questioned the lack of evidence presented by the Coleman campaign specifically relating to these uniquely registered and rejected voters. Friedberg countered by stating that the ECC would not accept the evidence despite his effort, to the point of "test[ing] the trial court's patience." Justice Anderson then explicitly asked Friedberg if their were any instances of fraud. Friedberg responded by simply stating "absolutely not" and added that there was no fraud of any kind; election, voter or otherwise. During Elias' statement, Justice Deitzen began to muddle through the messy statute associated with the challenging of ballots; Deitzen would later finished his line of questioning with Friedberg at the helm. Although the statute is not definitive, the application, as implement by the Attorney General during the recount, precluded either campaign from challenging the inclusion of any absentee ballot. This meant that once an absentee ballot was included by an election official for any reason, it would be opened and counted. This practice differed from the in-person portion of the recount in which the campaigns were allowed to challenge the election officials' ruling. The general gist of Coleman's address was that there are voters who have not had their vote counted, and are therefore disenfranchised; until they are enfranchised the campaign will continue to represent the interests of these 4,400 voters. This statement seems to align with Friedberg's opening remarks. Mr. Friedberg cited Minnesota's Judicial history of addressing all problems before they reach the federal level. Drawing from this prior statement it seems logical to conclude that if the MNSC does not address all of the problems, the Coleman campaign will seek federal relief. Marc Elias' brief address was followed up by a few soft questions from the media. Elias basically reiterated that he was confident of a Franken victory, but that he had no specific timeline in mind for a Supreme Court decision. If I had to guess at a timeline I would say by July 4th, but I really have no idea; the whole ordeal could drag out even further depending on what the MNSC concludes. Coleman's best case scenario is for the ECC to resume the trial with different rules and Franken's best case scenario is an outright win. Its also possible for this to end up in federal court as discussed above. I doubt very much will happen within the next two weeks. I also stopped by the Ramsey County Court House to obtain some other court documents that I'll hopefully be able to post sooner rather than later.